Forward Joyner Holmes had 14 points and 10 rebounds for her second double-double of the season to help the Texas women's basketball team complete the season sweep of Oklahoma with a 76-67 win in Norman (photo courtesy of texassports.com). NORMAN, Oklahoma — Center Jatarie White scored a team-high 17 points on 7-of-10 shooting to pace four Longhorns who scored in double figures, and forward Joyner Holmes posted her second double-double of the season with 14 points and 10 rebounds to lead the No 12 Texas women’s basketball team to a 76-67 win at Oklahoma’s Lloyd Noble Center. The victory completed the Longhorns’ season sweep of the Sooners. UT improved to 18-4 overall and 8-2 against Big 12 opponents; OU fell to 5-15 overall and 1-8 in conference games. Coupled with UT’s 73-63 victory Jan. 9, Texas completed the season sweep of the Sooners and now leads the all-time series between the teams, 33-25. 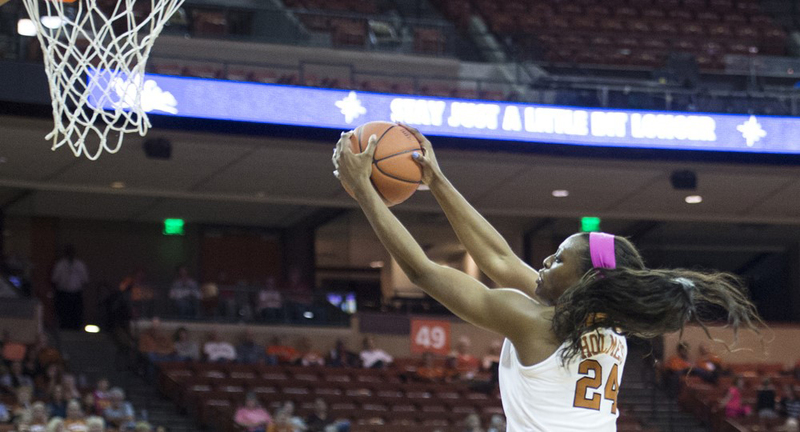 Guards Danni Williams and Sug Sutton also scored in double figures for Texas: Williams connected on half of her six shots from behind the three-point line on her way to 13 points, while Sutton added 10. The Longhorns will welcome No. 1 Baylor (19-1) to the Frank Erwin Center at 6 p.m., Monday, Feb. 4. The game will be shown on ESPN2.